Speaking at a joint press conference with his Turkish counterpart Mevlüt Çavuşoğlu, George Katrougalos said they are working to reduce tension in the region. The two met in the Mediterranean coastal city of Antalya to discuss an array of issues that have strained ties, including divided Cyprus and gas exploration in the eastern Mediterranean. Çavuşoğlu stressed that "any energy project in the eastern Mediterranean which excludes Turkey was "not realistic." Çavuşoğlu said the defense chiefs of Turkey and Greece could meet soon as part of new confidence-building measures aimed at reducing tensions between the NATO allies. Katrougalos added that the two were focused on pushing forward a "positive agenda." 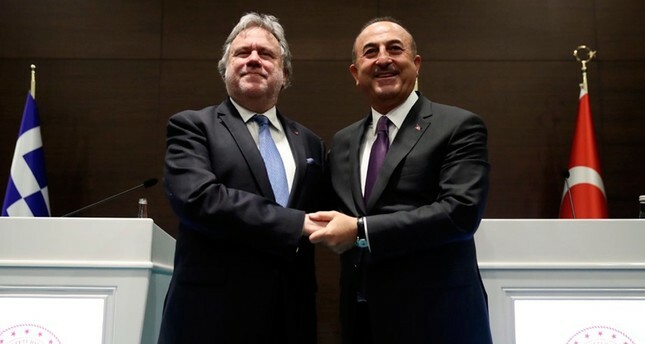 On Cyprus, Çavuşoğlu said he and Katrougalos would hold a series of informal meetings to see if a new peace effort for the island is possible. Any future talks over the divided island of Cyprus must be result-oriented, not just for the sake of talking, he added. The island of Cyprus has been divided since 1974 when a Greek Cypriot coup took place after decades of violence against the island's Turkish community and Ankara's intervention as a guarantor power. The latest attempt to reunify the long-divided Mediterranean island ended in failure in 2017 after two years of negotiations.